I know I'm dying for the range report. Your patient perseverance paid off. picture of the eagle proofmark? 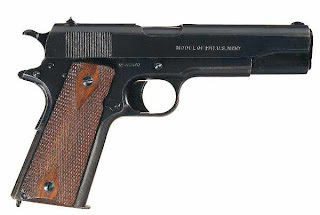 It seems very few know about the proofs that go along with the history of their pistols. 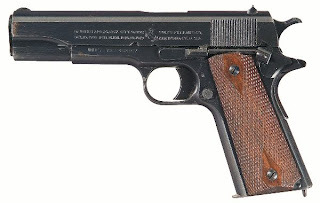 Additionally, few US pistols have proof marks since they aren't required in the US like they are in other countries i.e. Germany. The proofs and slide markings are an interesting bit of history all to themselves, and you can even learn a thing or two about the actual manufacturing process. Were the markings stamped, roll marked, etched; were the markings done before the slide was blued or after; when were the serial numbers added, etc. Matthew, the SA eagle proof can be seenin the second picture in this thread at The 1911 Forum. It's a beaut Xavier! Looking forward to a range report too! I got one of the Black Army 1911s, and replaced every spring with a Wolff spring pack before I shot it. A bit of insurance and piece of mind that protects both me and the gun. Detail stripped and cleaned, like you did. Replaced springs. Standard pressure 230 grain only. Sweet. 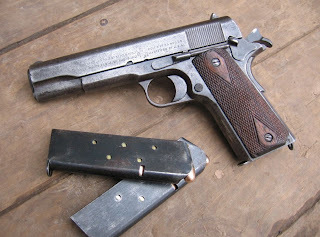 Now it is used as a range relaxer, shooting a functional piece of American history. And it reminds me that you don't shoot high thumb with these old ones. I hate you. But in a good and envious way. You've got a deal Tam! As you have always stated an interest in training green horns, I wanted to pass along something I came across today. While searching for a video on basic shotgun training for a friend, I came across a video on how to unload shotguns from a group calling itself "Stay Safe 4 families" (http://www.youtube.com/watch?v=vrBVZyRca1c). After looking at this video, I decided to look at the "Stay Safe 4 Families" channel, and found just shy of 2 dozen videos on basic gun safety. Although nothing special, the production values appear decent. I also came across a pair of videos that are an introduction to basic gun safety skills. Once again, the production values aren't anything special, but decent enough to show a friend. The first video is here: http://www.youtube.com/watch?v=J8Hm9PInOTY and I think it is a good introduction to the new shooter or to those who are uncomfortable around firearms. It looks like the videos were produced around 2004, so this could all be old news. But they have relatively few views on YouTube, so I thought I'd pass it along.